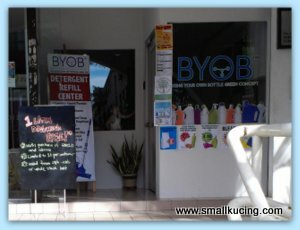 SMALL KUCING: BYOB (Bring-Your-Own-Bottles) Is In USJ Now!!! 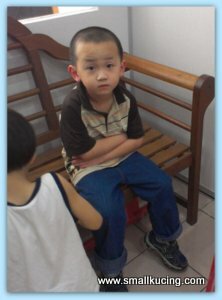 Not long ago, Mommy Ling gave Mamarazzi a bottle of floor Cleaner that she bought from BYOB. Mamarazzi found that it was very good. Finished liao but kinda lazy to go all the way to Cheras to get refill. Can you guess how happy she was when she saw Sasha announced that BYOB will be opening in Subang Jaya? Well, on Sunday we finally managed to drop by BYOB Subang Jaya Branch. It was kinda hard to find but me managed to find it some how. Small place but tastefully decorated and neat too. Sitting while waiting for Papa and Mamarazzi to decide on what to get. Quite a lot of products here. 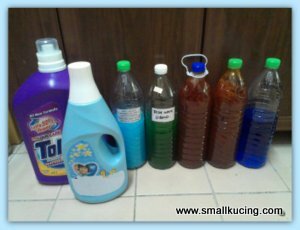 From body gel, soap, detergent to floor cleaner. They've got almost every cleaning products here. Very clever of them to put sample of the products nicely labeled for customers to see. 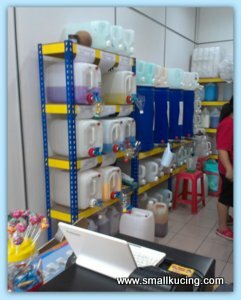 The products are stacked neatly on the shelves. We managed to get quite a variety of products. Total bill comes up to RM34 only. Not bad ya? Not only it's environment friendly but pocket friendly too. Thank you very much to Sasha for helping us to clean the bottles before refilling them. if i didn't know better, i'd think the store room looks like a drug lab!! Hi There, I'm trying to catch up after being gone for a week. Looks like an interesting place.. SO--if I understand, it looks like you take your own bottles and they will fill them with the floor cleaners, etc. which you want. That is NEAT... Don't think we have a place like that around here. Here in the USA, BYOB means "Bring your Own Booze".... That's definitely not floor cleaners! Glad that you found the place, and i guess many will find the store really helpful..
p/s: I've review on Switched book. Wonder when they would be coming over to EM?? The quality of the cleaner same as the branded 1? Oh..you are a user too. They should open one in Puchong. How I wish someone open this ship in my area? I am in for saving the environment and carrying your own bottles are a way in recycling. I should check out this place because its pretty cheap for the refills you did. 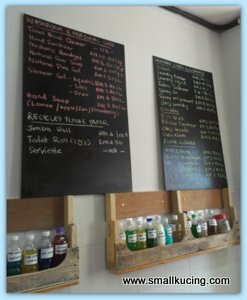 Hope Sasha will open a shop in Ipoh! Really good to use? Hmm I want to try too. Almost time for me to replenish the detergent. I think I saw BYOB somewhere but never knew it meant bring your own bottle. Quite cool concept they have there! so fast come back from your vacation? maybe you can open one over ther? Maybe you can consider opening one?